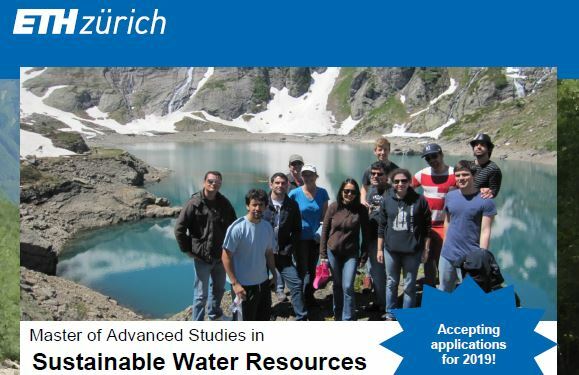 Applications are now being accepted for the Master of Advanced Studies (MAS) in Sustainable Water Resources, a one year postgraduate program at the Swiss Federal Institute of Technology (ETH) Zurich, Switzerland. The program begins in September 2019 and is taught in English. The MAS is designed to advance the education of water professionals on the importance of water availability and water scarcity in a changing world, at the same time preparing them to face the challenges of the future. For further information, see the flyer , visit the MAS website, check out the MAS brochure, or write to Darcy Molnar (MAS coordinator). If you are interested in joining this unique program at ETH Zurich, please start the application process now as spaces are limited.